A new report today claims that Apple is about to go on a big prepaid push, and is partnering with T-Mo and AT&T to do so. 9to5Mac reports that the Cupertino-based company is keen to boost iPhone sales by bolstering its purchase options. Customers will be able to buy an iPhone at full-price, and then connect the phone to a prepaid or monthly rolling plan, and do all of that from the Apple store. Activation will have to be done at time of purchase, unlike the current system where customers can buy an unlocked iPhone full-price, then take it away and sort out the carrier and monthly plan at a carrier store. Mark Gurman from 9to5Mac has quickly become the foremost source of Apple insider info over the past couple of years, and given his track record of getting things right virtually every time, I’m inclined to go with him on this one. Will any of you be buying your iPhones from Apple and activating them on T-Mobile in one of its stores, or will you stick to the Magenta-falvored locations? I wish I could do the EIP and phone trade-in or JUMP system at an Apple Store personally, though I understand why it’s not done today. So this just means apple can do the activations now? Not exactly a big deal, I was expecting “big prepaid push” would entail something more dramatic, like offering discounts on the phones if purchased in full, or offering device financing that would be charged separately from the service. Apple has done activations for years in the stores, just not for prepaid. For Prepay service, you had to buy the phone, then go to AT&T or T-Mobile and get the service. One stop for prepaid rather than 2 stops. It makes a huge difference in making a sale. For someone about to drop $700 on a phone I really don’t think so, that big of a purchase is planned out ahead of time. The sale is made before the customer even walks in the store, and the fact that (as someone said above) “they have to walk from the apple store to the T-Mobile store at the mall” isn’t a significant factor in this sales process. 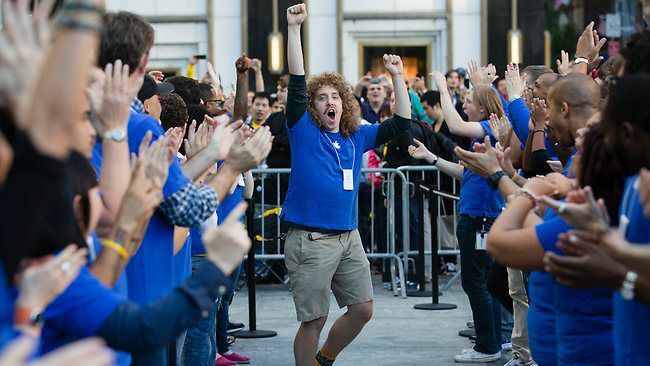 “Customers will be able to buy an iPhone at full-price”. Yeah? Will they really? Maybe a few. Apple doesn’t have a product that caters to the prepaid market, IMO. Being able to establish a ‘regular’ T-Mobile account and setup an EIP through Apple would be a much bigger deal. I was annoyed I couldn’t do it on my last purchase. I can see this as helping with ease of purchase in the Apple stores. Good move to make this available inside the store; one stop shop. Plus, it can help Magenta compete with Blue in the Apple store, even on the prepaid front. I’d be curious to see how the sales differ, even though it won’t be without fault since an employee might favor one over the other. I have a feeling that AT&T will be pushing their activation through their new Cricket Wireless (formerly Aio Wireless) brand. They specifically created Aio to compete with T-Mobile and specifically purchased Leap Wireless to establish a wide reaching prepaid brand that has scale and brand recognition to compete with T-Mobile. The white Rick James (see picture above) or a failed attempt at a Weird Al Yankovic. I guess it will save people the often long and treacherous walk from the Apple Store to the T-Mobile store at the mall. WE LIVE IN THE FUTURE, Y’ALL. 4G has been turned on here in Yuma, AZ. No sight of LTE yet..
Do you have an LTE capable device? Odd that they wouldn’t be offering all of T-Mobile’s prepaid plans, including the $80 unlimited LTE plan. By far the best value in wireless, especially for Savvy users who need more than 100 minutes and just use VoIP apps (Skype, groove, etc) and essentially get an unlimited everything plan for $30/month. This would be detrimental to T-Mobile stores. Especially the ones at Mall’s where there is a lot of tourist traffic.